These workstations will be randomly generated in some (but not all) habitats the player discovers in survival mode. Another objective we would like to include in the survival mode of Lacuna Passage involves the new research station. This area would be utilized by collecting rock and mineral samples in order to better understand the geology and biology of Mars. Although this goal would not directly affect your survival, we found that having multiple open-ended objectives is more enjoyable. As we work to create many new and interesting areas in the habitat, we are always trying to utilize existing models and elements from other assets. We reuse as many pieces as possible, like the computer monitor mount and work station tabletop. Even the wall and outlets are recycled bits from other sections of the habitat. It's important that we create these assets in ways that would allow us to reuse them in the future. 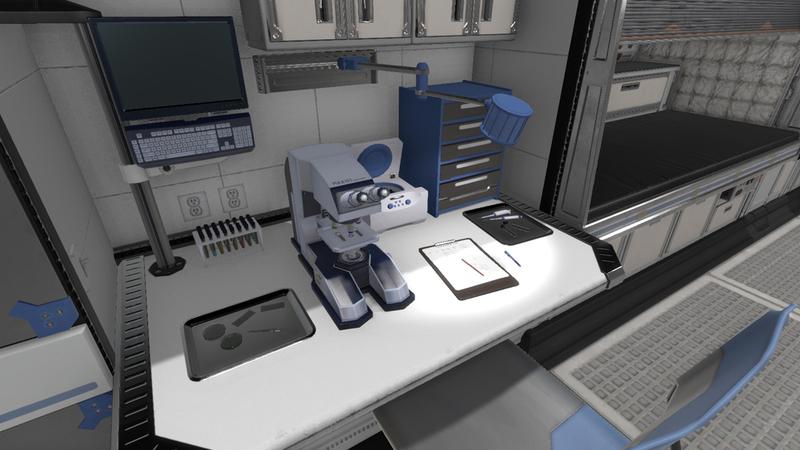 For example, the microscope pictured above was one of the very first internal habitat assets we created, but we have a variant with an attached computer monitor and keyboard that we can use in other locations. We have plenty of other ideas in mind for interactive workstations, and we hope to have even more to show next month. Let us know what you think in the comments.